Mouth-watering, rich Tuna flavour your feline friend craves. No artificial flavours. 100% nutritionally complete. 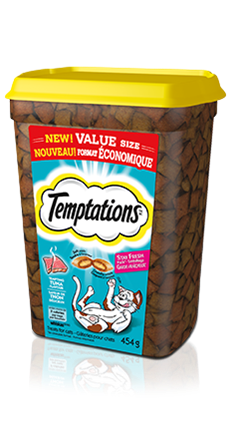 TEMPTATIONS® Tempting Tuna is rated4.6 out of5 by64. Rated 5 out of5 byCortes Bella fromCats come home from 3 houses away!I have two 11 month old kittens. They are 90% of the time in the house. They "escape" every once in awhile as the dog is going outside. They love your products which I use as treats for them. I remembered a commercial that I saw with the cat who came up the high rise apt balconies for his treats. I tried it and they both came barreling home from over three houses away as I watched ! Amazing ! Rated 5 out of5 byGRACECON_3721411978 fromOur 14 yr old cat has always turned up her nose at treats of any kind (including freshly caught raw salmon). Offered her a temptations treat - she ate it and nearly took my finger off getting the next one! After 1 week she knows the word 'treat' and heads to the kitchen without my having to shake the bag anymore! Have bought some other flavours and she loves them all! Rated 4 out of5 byLUCIALON_3721412066 fromBoth my cats loved this. One of them is a very finicky eater who doesn't like most things so I'm always surprised to find food she actually likes. Both my cats come rushing whenever they HEAR me grabbing the bag. I'm very pleased with this products because my cats seem to be. Rated 5 out of5 byCARRIETMB_3721412621 fromThe product is crunchy, stays fresh, doesn't get soft or soggy. Our cat really likes them! It's nice to give them a treat that they enjoy either as a reward or a just because you're you treat, thanks for making a great product! Rated 5 out of5 byCAROLMSK_3721301153 fromBoth of my female cats loved the product - if I don't know where in the house one of them is sleeping I use the product as a cat call - I shake the package and call treats . They both literally run to me. Rated 3 out of5 byMEGCMB_3721304685 fromMy cats liked them alright, but I wasn't very certain about how healthy they were for them. I prefer treats that have natural ingredients and benefits, such as good for teeth or their urinary tract. Rated 5 out of5 byKathylaughter fromBeyond the best snackies out there!These have become an addiction to my cats. There's something about your tuna that they find absolutely irresistible. I don't know how you do it, but it's perfection! Only treats I'll ever buy! Chicken By-product Meal, Ground Corn, Animal Fat (Preserved With Mixed Tocopherols), Dried Meat By-products, Brewers Rice, Wheat Flour, Natural Flavour, Grain Distillers Dried Yeast, Potassium Chloride, Choline Chloride, Salt, Taurine, Titanium Dioxide Colour, Dl-methionine, Calcium Carbonate, Vitamins (Alpha Tocopherol Acetate [source Of Vitamin E], Vitamin A Acetate, Niacin Supplement, Vitamin B12 Supplement, Riboflavin Supplement, Thiamine Mononitrate, D-calcium Pantothenate, Vitamin D3 Supplement, Biotin, Pyridoxine Hydrochloride [vitamin B6 ], Folic Acid), Minerals (Zinc Sulfate, Copper Sulfate, Manganese Sulfate, Potassium Iodide), Natural Tuna Flavour, Iron Oxide, Mixed Tocopherols (A Natural Preservative). 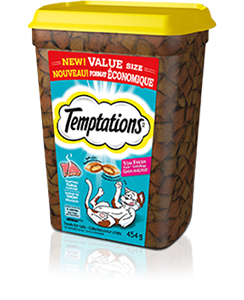 TEMPTATIONS® Tempting Tuna Flavour Treats for cats is formulated to meet the nutritional levels established by the AAFCO Cat food Nutrient Profiles for all life stages. AAFCO stands for the Association of American Feed Control Officials. AAFCO develops standards for dog and cat nutrient profiles which are used as model regulations in the United States. AAFCO feeding protocols are referenced the ""Guide for the Labeling and Advertising of Pet Foods"" endorsed by the Competition Bureau of Canada as well as in the Guidelines for the Canadian Pet Food Industry, developed and administered by the Pet Food Association of Canada. These documents were created to help pet food manufacturers ensure that the food that they manufacture, distribution and sale of animal feeds are safe and of high quality. Click to buy from any of the retailers below. ®/TM Trademarks of Mars, Incorporated and / or its affiliates. © Mars, Incorporated, 2017. All rights reserved.